Those Seven Sages would choose only One as the Wisest of All. 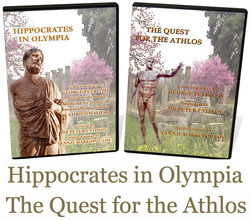 The Father of Medicine uses his advanced holistic medical techniques on the revered athletes at the ancient Olympic Games. This documentary interviews survivors of the modern day genocide of 1.5 million Greeks from the Pontos and Micra Asia (Asia Minor) regions of modern day Turkey. On July 20, 1974 the country of Turkey began the illegal invasion of the independent Greek island of Cyprus. It continues today. Interviews with Greek immigrants, who came to America before 1910, and their recounting of their experiences in America which are contrasted by their relatives back in the "old country". 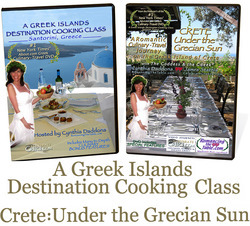 Travel to Greece by watching this video and experience a wonderful Greek Islands Gourmet Cooking Class in the village of Thera on the island of Santorini. The beautiful Greek island of Crete was the birthplace of the world famous Mediterranean Diet study that showed Cretan villagers’ farm-to-table cuisine and lifestyle were one of the healthiest and longevity producing ways-of-life in the world. Celebrities include Marina Kanakarides (CSI), Nia Vardalos (My Big Fat Greek Wedding), Michael Constantine (My Big Fat Greek Wedding), Oscar winning actress Gena Rowlands, 2X Oscar winning director Alexander Payne (Sideways, Descendants), Oscar Winning Actor George Chakiris (West Side Story), and many more! 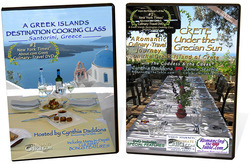 The modern Greek island of Santorini haunts us to identify it with Plato's Legendary Lost Island of Atlantis. A village wedding on the Greek island of Santorini. 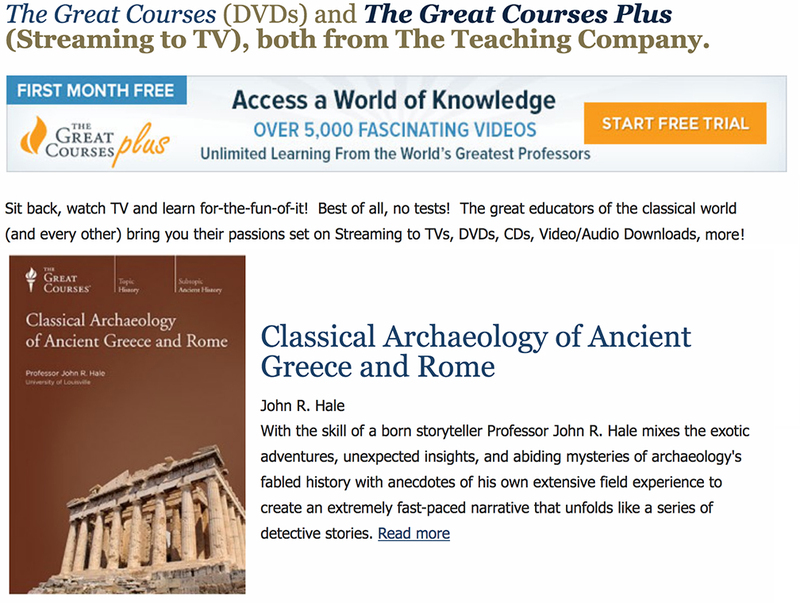 This documentary consists of interviews of Americans and Greeks together at the United Nations demonstration on January 16, 1993 as well as a tour of a museum exhibition in Montreal, Canada featuring ancient Greek art of Alexander the Great’s and Greece's Macedonia. Documenting the 100+ years since the birth of labor unions in America. A 62 minute, unedited video interview with the International Workers of the World, I.W.W., labor union innovator and organizer, Angelo Rocco, conducted in 1977 when he was 93 years old. 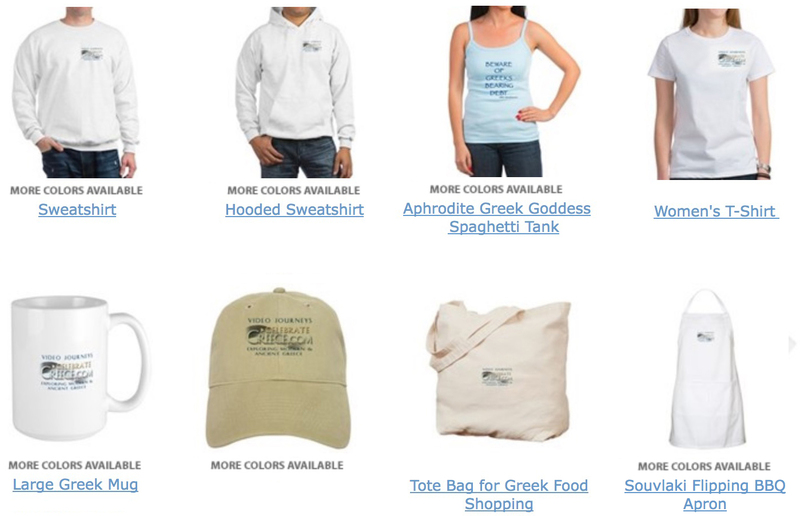 CLOTHING, Mugs, Hats, Posters and More! *Amazon Prime Video presently serves only USA, United Kingdom, Germany/Austria and Japan. Worldwide coverage is expected soon. Not all titles are available on DVD and/or not all titles are available on Amazon Prime Video. Amazon, Amazon Prime, Amazon Prime Video and Amazon Instant Video and all associated images are trademarks of Amazon.com. All Rights Reserved.